A pocket knife is a great tool that can be used for general purposes by those that enjoy the outdoors but don’t want to carry around a survival knife. However, having a great pocket knife and having a pocket knife that can get the job done when needed are two different things. In this article, we are going to cover how to sharpen a pocket knife. There are several ways you can accomplish this task. Many that are experienced in how to properly sharpen their pocket knives have their own unique way that works best for them. The method we are going to cover is easy for the beginner. For this technique, all you need is honing oil and a sharpening stone. Now that we have covered what tools you will need, let’s get to the process of sharpening your pocket knife. These are very simple steps and with practice, you will be able to put a razor sharp edge on any knife you desire. Start by taking a look at the condition of the blade. If the blade is very dull, you will want to begin with the side that has the rougher grit. If your stone is not marked indicating the grit level, simply drag a fingernail across the surface of the stone. You can easily identify which side is rougher and more porous. With the rougher side of the stone identified, you now have to prep it. If you are using oil, which we recommend since it is a little more forgiving, apply a generous amount of oil to the surface of the stone. It doesn’t have to completely drenched but you do need to make sure you have enough. Additionally, if you are using a brand new sharpening stone, wait a few minutes to see if the stone soaks up the oil. If so, apply more oil. Place the knife blade on the stone so that it is laying flat. Before you start, raise the blade to an angle that is between 10 and 15 degrees. While you will eventually be able to tell when you have the right angle, it can be challenging for beginners to consistently maintain the same angle. With that said, we recommend using a sharpening guide. They are inexpensive and can help you maintain the same angle. Start your first stroke. There are many ways you can sharpen your blade and this method is a simple one that works. With the blade at the correct angle, swipe down, ensuring you also sharpen the tip of the blade. Remember how many strokes you use, because it’s very important to use the same number of strokes on each side to achieve a sharp edge. You can do a set number of strokes per side if that feels the most comfortable to you. However, it is also alright if you want to alternate sides, doing one stroke on one side then flipping the blade over and doing a stroke on the other side. Whichever method you choose is up to you, just keep in mind that you have to complete the same number of strokes on both sides or the blade’s edge will not be even and the blade will not sharpen. It’s good practice to finish off with a few alternating strokes regardless of the method you use. After completing the process on the rougher side of the sharpening stone, flip the stone over and repeat the steps on the side with the finer grit. Remember to apply a generous amount of lubricant and to check for absorption. Congratulations! You now know how to sharp a pocket knife. Overall, the process isn’t too hard. The key to sharpening a pocket knife is to maintain a constant angle throughout the entire process. As long as you keep this is mind, everything else will be a cakewalk. If you’re unsure of what tools needed to sharpen your pocket knife, keep reading and we’ll guide you through the process of picking up a sharpening stone and honing oil. As we stated above, all you need to sharpen your pocket knife is a sharpening stone and a lubricant. However, if you have already started looking at all of the different types of sharpening stones available, you undoubtedly are overwhelmed by the choices. Here is what to look for in a sharpening stone, as well as a lubricant. Sharpening stones, also known as whetstones, are available in many different styles. Some sharpening stones have two sides that have different grit levels. Typically this will be a rough side and a smoother side. There are also high end sharpening stones that are encrusted with diamond dust on its surface. Other high end sharpening stones are known as Japanese water stones which are meant to be used with water instead of honing oil. Once you become more advanced at sharpening knives, what type of stone you choose typically depends on the function of the knife and your preference. Trying the different types of stones is really the only way that you will find which one works best for you. For beginners, there’s a few factors we’re going to take into consideration. If you are trying to sharpen a high-end pocket knife or a hatchet, you might want to skip buying the cheapest sharpening stone available. 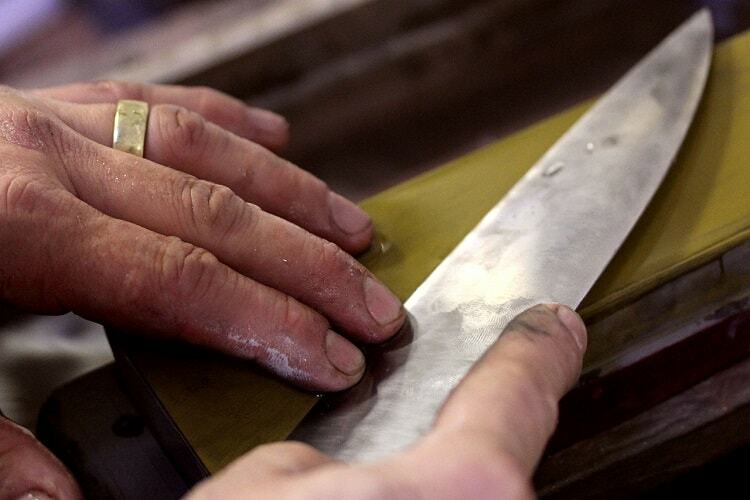 The low quality materials used to make the sharpening stone could damage your knife blade. Sharpening stones can be very expensive, but buying a high-end model might not be the answer either. If you’re just starting out sharpening your pocket knife a good basic sharpening stone will be perfect. For the beginner, a good sharpening stone such this Bora sharpening stone can be bought for under $10. Once you learn how to properly sharpen your knife, you can try more expensive stones to see how they work for you. Until then, our basic sharpening stone will be perfect for honing our pocket knife. Oil stones are typically the type of sharpening stones you would find in your Grandpa’s shed. They are available at most hardware stores and are great for putting a very nice edge on your pocket knife. However, if you are working with an older knife with a very dull blade, this type of stone can take a long time to get the desired edge due to its typically finer grit. Diamond sharpening stones are great for getting a razor sharp edge on your blade. Ones such as Smith’s DCS4 can be bought for under $20 and will last a lifetime. Diamond dust embedded on the blade will be good for hundreds of sharpenings and last you forever. Ceramic stones are another type of sharpening stone that should only be used once you have plenty of experience. For starters, you have to be careful because the quality in the ceramic plays a huge role in how well they will do their job. Too hard, they glaze over and will be ineffective. Too soft, they will wear out quickly and will need to be replaced. They also require a lot of care. With proper technique and experience, you can get an edge like no other with a ceramic stone. Synthetic sharpening stones are becoming one of the more popular options. Some require light lubrication while others require a soaking period before you can use them. These are ideal for western style knives. Synthetic sharpening stones combine great materials engineering with design to produce an easy to use tool that gets your pocket knife’s edge sharp. While natural sharpening stones are probably the best you could ever get your hands on, they are also the most expensive. Once mined in Japan, natural sharpening stones give your knife a long lasting edge due to the random grits found in the stone. Sadly, the majority of the mines in Japan are now closed and have caused a limited supply with a continually growing price tag. 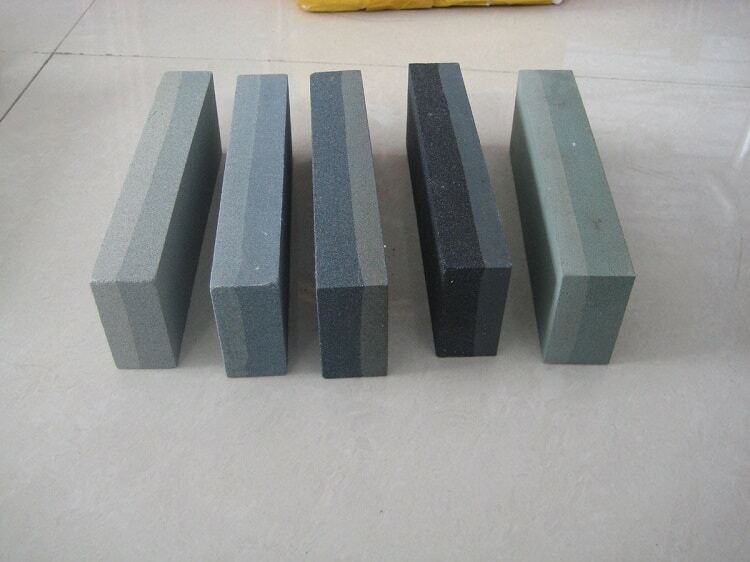 As we have stated, there are many different types of sharpening stones available on the market. Trying to find the one that is just right for you can be a bit of a struggle if this is your first go at sharpening a pocketknife or any other type of blade. Here are some tips on what to look for. 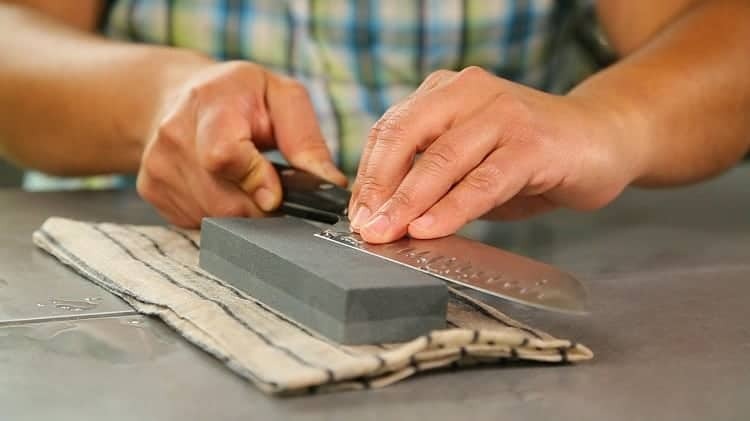 Find a sharpening stone that has at least two different grit levels, a rough grit, and a smoother grit. You will need the rougher grit if you are working with a really dull blade to shape it and the finer grit to ensure a nice edge. The size of your knife will be a factor in determining the size of the sharpening stone you will need. While 6-inch, 4-inch, and 3-inch stones are common and more than adequate for smaller pocket knives, larger knives will require a larger stone. If you have a larger pocket knife, consider an 8-inch sharpening stone. Keep your budget and need for a sharpening stone in mind. If your pocket knife is to be a daily used tool, you will want to have a quality sharpening stone on hand. However, good stones can have a high price tag. Don’t go crazy on the price for something you will only need once in a great while. Honing oil acts as a lubricant when you sharpen your pocket knife in order to prevent damaging the blade. As you run your blade across the stone, metal shavings from the sharpening process can accumulate on the sharpening stone and make it less effective. Some people use water as a lubricant, others use mineral oil. However, you can buy honing oil designed for use with a sharpening stone for around $5. 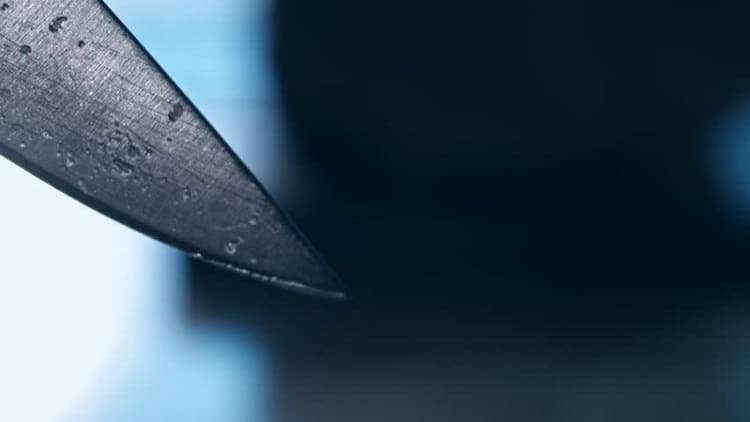 Additionally, the friction that is created while sharpening can damage the blade on your knife. Know that you know everything needed to sharpen a pocket knife, you can go enjoy your razor sharp tool in the outdoors. Whether you find yourself whittling away using it as a whittling knife, or setting traps and snares using your bush craft skills, you can always count on having a sharp pocket knife.